If these two recently released posters for The Twilight Saga: Breaking Dawn Part 1 tell us anything, it’s that things will be heating up when the story resumes on the big screen this November. Tension seems to be the common thread in both of these posters, though for different reasons. 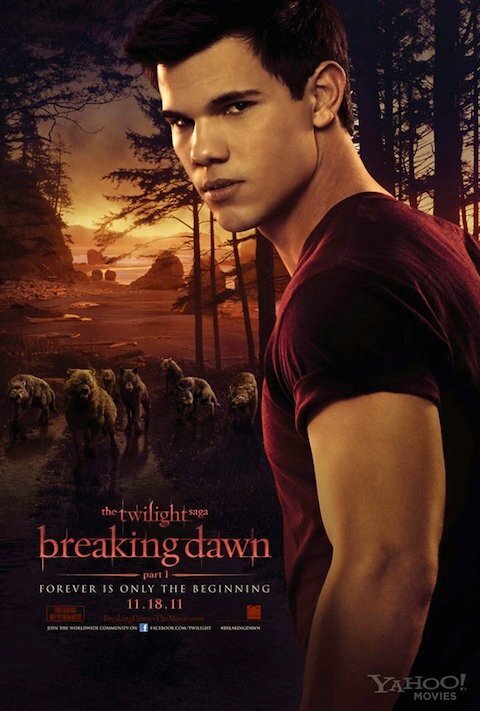 Yahoo posted the posters, which tease of things to come for Edward, Bella and Jacob. The first poster features Edward and Bella looking like they’re on the verge of kissing each other. Note Edward’s wedding band and the phrase “Forever is only the beginning,” below the title. And in this one, a serious looking Jacob looks ready for a fight, with his wolf pack lingering in the background. Neither poster is all that revealing, given what we already know from the series. Then again, for those of us who’ve read the books, looking forward to the final two films is less about wondering what will happen as it is wanting to see how it all plays out and whether or not it matches up with picture Stephanie Meyer painted in our minds through Breaking Dawn. In that respect, the tension in the posters lines up well with the story. Moments of genuine levity are, after all, few and far between in Edward, Bella and Jacob’s world. The Twilight Saga: Breaking Dawn Part 1 heads to theaters on November 18th.